We left Escondido and stopped again at Candoleros. We had a great lunch at the resort http://www.villadelpalmarloreto.com/. The staff was very welcoming and we were given a wristband to allow use of the pools and other amenities. This is one of 3 pools and there is also a hot tub big enough for my entire high school class. At the edge of the property is a teat enclosed private casita available for special events like a honeymoon or other get away. We made our way in 2-3 ft seas, mostly on the stern, to Isla San Francisco and the famous hook. I was feeling much better and we went ashore and hiked to the top of the overlook. For once there were more power boats than sailboats at anchor. Nordhavn 64, N60, N55 and WORKNOT. A 36 Grand Banks joined us later in the evening. Our “car” is our small dinghy and getting ashore gets better as we gain practice. Here in Mexico the small dink gets all the work. 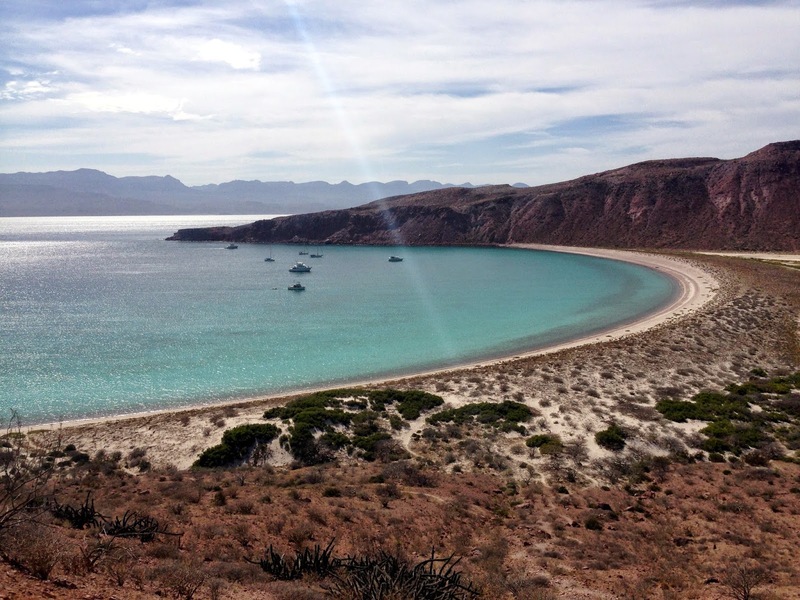 Next morning we moved on to La Paz and back to Marina Cortez. Not much going on, warm @ 85 to 90 F and small seas. When we rounded the corner into the La Paz channel we got a glimpse of a few other power boats enjoying the drier La Paz weather. The humidity is more desert like than the mainland the it generally cools off at night this time of year. This is a charter boat that we have seen in Mazatlan, Puerto Vallarta and now in La Paz. The woodwork is outstanding! The white boat behind the sail boat was built by the late Steve Jobs. The blue yacht is ATESSA, belonging to Denny Washington. He is a self made entrapunue with many interests including professional sports team, Komatsu Distributor and mining interests. The boat was purchased by him after a fire and he did a major refit. She spends a lot of time in San Diego. Our stay in La Paz was only a week long and we took time to provision for the trip back to Ensenada. My entrance to the dock was much more graceful this time and there was no need to cover the name on the transom. On Saturday the main street by the water was blocked by Baja off road racers getting ready for rally. The race started downtown and the cars sped off with both sides of the street full of on lookers. Some of the faster cars and trucks were well over 60 MPH by the time they got past the line of spectators. In-between cars people crossed the street and generally crowed closer and closer to the action. One locked brake and it would have been a disaster. The guy had just slowed down. We had a desert party on the night before we left. Who knew our salon would hold so many? No one wanted to get out of earshot of the tales being told. As you can see most of the world’s problems were being solved at this table. Along the beach we saw these sand sculptures done by local artist using cement, paper, some wire and beach sand. Craftsmanship with minimal materials and just for the fun of it. On our way out of La Paz we took on 965 gallons of fuel. $4.17/gal. Just over 2 hours to fuel. The days of cheap Mexican fuel are over as the state run petrolemum PEMEX has been removing the subsidy over the past year. Fuel in San Diego is about the same price. We are fairly heavily loaded with 1200 gallons aboard. Don’t expect to buy fuel again until we reach the Pacific Northwest. We may take on some fuel in San Francisco to be sure and be heavy for the expected head seas. WORKNOT rides better we the forward water tank empty and all other tanks loaded. The give us about 175 gallons of water and up to 1,300 gallons of fuel. Approximately 11,000 # difference light boat to loaded. The fuel dock was busy…..
Daybreak, N60 just ahead of us. Very calm trip to Muertos, caught a small Bonito and released in the Ceraldo (SIC) channel. When we got to Muertos our friends and fellow FUBAR traveler Janna Banna were already on the hook. They are headed to San Diego and expect we will see more of them along the way. David and Jan’s Meridian 58 is a semi planing hull or better. They are avid fishermen and managed to find a rock near La Cruz. They spent a month on the hard getting major repairs done but looks like they are back 100%. You can see more on their blog http://janabananatolapaz.blogspot.mx/2014/02/february-13th-punta-mita-to-la-cruz.html Much faster than us but the weather will decide if they can use the speed. Love your post! Especially not having to cover up the name of your boat! Hahaha. See you two in the seas.